Since the global financial crisis, the financial condition of the banking sector has become the hot topic in the European public debate. Stable, strong banks are important both in good economic times as well as in bad ones. In good times, they help to finance enterprises which, in turn, drive economic growth and provide employment. In bad times, unstable banks can pose a threat to the integrity of the financial system and even damage the economy. The overall number of banks and credit institutions in the European Union decreased to approximately 6.6 thousand in 2016, from 8.4 thousand in 2009. A decline in bank branch numbers in Europe has also been noted. The highest share of local population per bank branch was observed in Estonia, with one bank branch providing for approximately 13.3 thousand inhabitants. A decline in branch banking is frequently linked with the growing popularity of new banking methods, such as online or mobile banking. However, only 15 percent of European mobile device users were inclined to favor social media in communication with the bank. The share of consumers who already use social media to interact with their bank was highest for Eastern European and Benelux countries. Overall, total assets of all banking institutions in the euro area (excluding the UK) amounted to 31.22 trillion U.S. dollars in 2016. Against this backdrop, assets of domestic banking groups in France, the third leading European economy, reached over 6.85 trillion euros in 2016. The second-ranked were German banks, with 6.58 trillion euros in assets. The largest bank domiciled on the European market affirmed its strong position in 2017: HSCB Holdings, headquartered in London, claimed 2.1 trillion euros in total assets, confirming its highest ranking on the European market. The scale was balanced by BNP Paribas (headquartered in Paris) and Credit Agricole Group (Paris), ranked second and third, both with over 1.7 trillion euros in total assets. 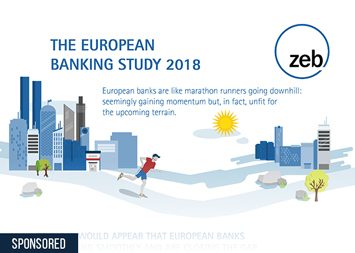 European banks have been growing in stability since 2014, under close supervision of the European Central Bank. To ensure further growth of the sector, careful risk management approach was prioritized by 70 percent of surveyed senior bankers as of 2016. Also, the automation of services and investments in technology were considered an important development priority. In 2016, 44 percent of bankers in the Netherlands looked towards partnerships or joint ventures as means of providing stability in the sector. However, with Brexit looming on the horizon, the future of financial services and banking in Europe in general, and the role of London as the global financial center in particular, remain unclear.